Enjoy direct real-time access to real returns with risk transparency. Establishing or topping up your Marketlend investment portfolio couldn’t be easier. The Invest Now service automatically matches the optimum investment loan mix to your preferred investment criteria. You simply choose your level of investment without the need to locate and analyse each loan in detail. Keeping you in complete control, you can still review the loans or portions of the loans you are funding at any time. Step 1. You set your invesment criteira. Step 2. Invest Now matches the best possible investment set to your individual requirements. Step 3. 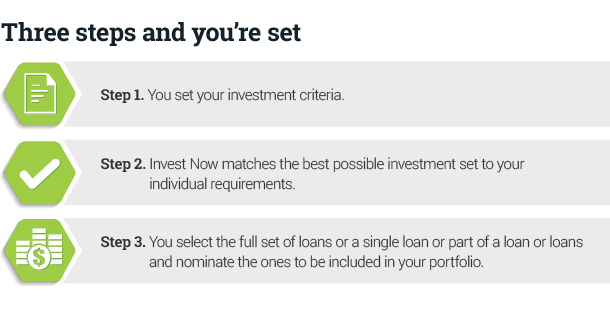 You select the full set of loans or a single loan or part of a loan or loans and nominate the ones to be included in your portfolio. If you’d prefer to create your own portfolio from scratch go to Browse Listings.